Congratulations to Chief Justice Kavanaugh, for surviving the largest unnatural political disaster America has suffered. No one suffered more than he. What now for America? How do we clean up the debris of people’s lives and reputations, the chasm created by the bombs of dishonest, partisan political rhetoric, and the rubble of our Constitutional mandate that we are innocent until proven guilty? This unnatural disaster for our country was not perpetrated by the American populace, but by the very people that voters put in positions to represent them, with the accomplice of the media to drop bombs indiscriminately amongst us. This is not what we elected our representatives to do. Politics is not a win at all costs game, it is a working body with the mandate to represent all Americans and move us forward for the betterment of all of us. Democrats would have opposed any justice President Trump forwarded. 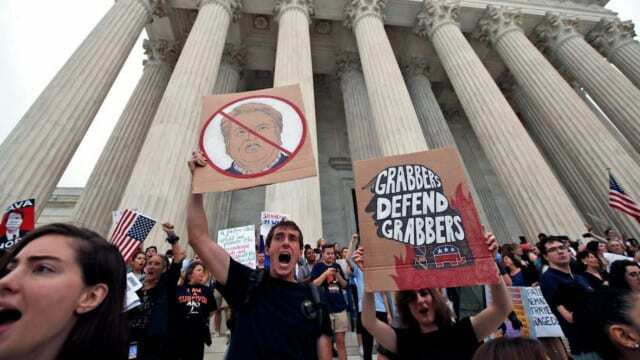 After the weaponizing of Susan Ford, willingly or unwillingly, failed, they moved the goalposts to say that Judge Kavanaugh does not have the temperament to be a Chief Justice. I am most disappointed in Lisa Murkowski, the lone Republican “present” voter. She echoed the democrats voicing concern of the temperament of Judge Kavanaugh. Did she look at the decades that Judge Kavanaugh has had his judicial temperament on display in courtroom after courtroom and note that has had an impeccable career and judicial temperament? I would challenge she and any democrat who uses this excuse to be subjected to what Judge Kavanaugh has been, to be falsely accused for political purpose, to have himself and his family threatened with physical violence; his good name, reputation and future career imperiled, and maintain your composure in the face of your attackers. These are all red herrings for people that never had any intent of voting for Judge Kavanaugh. So because democrats lost the election, and fear a conservative Jurist on the Supreme Court, they have scorched all of America. They have damaged the rule of law, they have risked the safety of many Americans, and they have damaged women and men by crying wolf when there was no wolf, just too many times. There is no American who should see Judge Kavanaugh as a sexual predator, yet they do, thanks to a false smear campaign against a good man for political purpose. Shame on every one of you who perpetrated this injustice to another human being. This is no different than a soldier in war who decides to take matters into their own hands and torture and kill people in villages. This is against our rules of engagement, and so should the behavior we have just witnessed be. We have left civility in the dust and have an uncivil group of politicians who have long forgotten their role in service of Americans. Susan Collins laid out the facts in a most eloquent speech, many in the Senate should take note of how it’s done. The nastiness on the democrat side is dishonest and unethical. To the common American, these people don’t even make sense, and their assumption that we are stupid and gullible should be reason to be insulted and vote them out. It is up to us, those common hardworking, family of Americans to clean up the damage done to our country, our rule of law, our hurt and anger, our international reputation. Where do we begin? None of us deserved this unnatural disaster perpetrated upon us by an angry mob of democrat Senators and their gunners, the media. We start with the mid-term elections. We vote the nasties out and vote in people who understand their role as public servants, not public hit men. Whatever the political preference, it is undeniable that our country has moved forward in a positive way under President Trump. It is also undeniable that the Republicans handled themselves with professionalism throughout this political battle and the democrats did not. The people being paid by George Soros to show up in protests in Washington, the people intimidating politicians in their private times with family, the people doxxing our representatives, are not the majority of us. That majority can end this war and begin the cleanup and the putting back in place of our American values. We have the next generation watching what we do. It’s important. We need to fight to maintain our country, our values, our American heritage and future. This election, our choices, will entrap America in further conflict, or head us on a road to a better future.